On Sunday afternoon—just 24 hours after Texas Gov. Rick Perry announced his presidential candidacy—an email arrived in my inbox titled, “14 Reasons Why Rick Perry Would Be a Really, Really Bad President.” The article contained in the email took such a harsh tone toward Perry, I assumed, for a brief moment, that a liberal interest group was quickly jumping on the newest entrant in the Republican presidential field. In turns out, however, that the piece was the product of a right-wing website called The American Dream. The author of the article argued that Perry, the supposed savior of conservatives nationwide, is actually a RINO—a Republican in Name Only. For Texans, this line of argument is nothing new. Indeed, for anyone who’s closely followed Perry’s tenure in Texas—as I have, covering the governor for The Texas Observer since 2003—it’s no secret that some of the state’s conservatives and libertarians dispute his conservative credentials. It’s true that Perry has trafficked heavily in anti-Washington rhetoric, especially in the run-up to his candidacy to become president. But the closer you look at Perry’s record in Texas, the harder it is to discern any coherent ideology at all. When GOP primary voters in other parts of the country examine his signature legislative accomplishments and policy stances, some won’t like what they find. The first Perry proposal to rile some Texas right-wing activists was the Trans-Texas Corridor—an ambitious plan to cover the state in a series of toll roads. Perry first pitched the idea during his 2002 campaign for governor. The plan would have used government’s eminent domain authority to seize rural farmland not just for multi-lane tolled highways, but also for rail and utility lines. Perry’s office and the Texas Department of Transportation gained legislative approval for the plan in 2003. The state handed the contract for the road planning and building to a Spanish-based company named Cintra. The backlash from rural Republicans was intense. It was a text-book example of a policy that classic small-government conservatives would hate: Seizing farmland with eminent domain, then handing public money to a foreign company that would built roads Texans would have pay tolls to drive on. Anti-Trans Texas Corridor buttons soon became one of the most popular items among delegates at Republican State Party Conventions in 2004, 2006 and 2008. Perry’s plan for a comprehensive network of toll-roads would eventually die slowly over the next four legislative sessions, meeting resistance from conservative Republicans. Toll roads are still being built in Texas, but the corridor plan is remembered as a colossal failure for the governor. 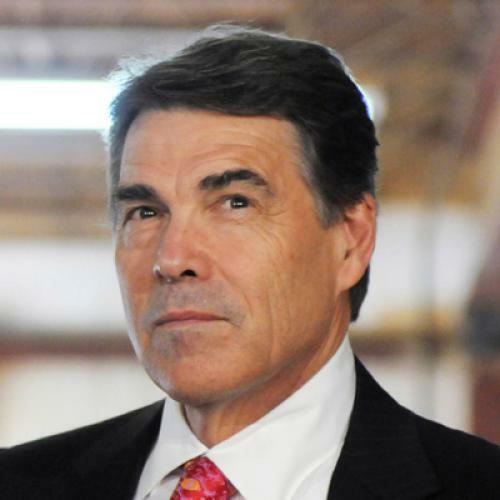 Perry caused conservative revulsion again in 2007 when he proposed that all young girls in Texas receive the HPV vaccine. The drug company Merck had just put the drug on the market, and the governor’s office made a heart-wrenching case for why all Texans should have access to it. His office brought to the Legislature a young woman with terminal cervical cancer, caused by HPV, to meet with the press and argue for mandatory vaccinations. Some Texas Democrats agreed with Perry’s position. But the governor’s critics also pointed out that Perry’s former chief of staff, Mike Toomey, was serving as a lobbyist for Merck, which stood to make millions from the vaccine requirement. In the end, conservative Republicans in the Legislature bucked at the thought of requiring young girls to receive an STD vaccine, and Perry's effort died in the Legislature. Then there’s the one major proposal that Perry did, in fact, pass into law—the state’s business tax. This tax increase on business was crafted in 2006 as part of a school-finance reform. The idea was to cut local property taxes and replace the lost revenue with a new business margins tax. This 2006 tax “swap” was the one instance during Perry’s decade as governor when he proposed a wide-ranging plan and successfully pushed it through the Legislature mostly unchanged. It will likely be remembered as his signature legislative accomplishment. The problem is, it’s been a disaster. Small businesses hate it because they’re forced to pay regardless of whether they’re turning a profit: it seemed to be the very definition of a “job-killing” tax. Some conservatives simply hate it on principle. A few even argued that Perry’s business tax is unconstitutional—amounting to a tax on income, which is forbidden by the Texas Constitution. But worst of all, the tax doesn’t even generate enough revenue. The tax “swap” has cost the state $5 billion a year for five years running. The Texas budget now faces an ongoing structural deficit because of the underperforming business tax. And with a tax increase on small business and a structural budget deficit to boot, it’s clear that Perry hasn’t taken conservative economists like Milton Friedman as his inspiration. Another example of his conservative heresy is the Texas Enterprise Fund, which Perry seem to be especially proud of. The purpose of the Fund is to dole out public money to lure companies to Texas. It has created tens of thousands of jobs in the state, but critics have not incorrectly, labeled it “corporate welfare,” a slush fund for well-connected businesses. The Observer investigated the fund in 2010 and found that several companies with political ties to Perry had received state grants. Some Texas Tea Party activists have been especially critical of Perry's Enterprise Fund, labeling it a quintessential example of wasteful government spending. None of this is to say that Perry has been ineffectual in office. He has used his veto power (or the threat of it) to repeatedly bend the Legislature to his wishes. And he’s utilized his power of appointment to build a web of political patronage that stretches across every entity in state government. But while he's a charismatic campaigner, a natural performer with keen political instincts, there's no ideological compass that guides his policy decisions once the elections are over. The specifics of his positions are often a matter of expedience. For instance, over the course of this year, as Perry has been considering his run for president, Texans have watched him take hard-line conservative positions on immigration. Prior to 2011, Perry—much like George W. Bush—had been a moderate on immigration, a history that may end up harming him in the GOP presidential primary. As governor of Texas, Perry’s lack of policy depth hasn’t hindered him much. He simply lets the Legislature do the heavy lifting. When the Legislature isn’t in session, Perry is largely content to float from one public appearance to another, cheerleading the Texas economy. He rarely bothers to diagnose the state’s problems, or offer any novel solutions. When Perry does involve himself in policy debates, the most consistent thread is that he has sided with big business—that is to say, with industries big enough, or fortuitous enough, to have strong connections with the state government. It's a pattern that repeats itself not only in the HPV and Trans-Texas Corridor episodes—both of which would have been bonanzas for select companies—but in his business-friendly approach to immigration and job-creation programs. In many ways, Perry is quite conservative. He espouses limited government, low taxes and light regulation. But in his 10 years as governor, he’s often strayed from conservative orthodoxy. If there’s one phrase that best describes Perry’s governing ideology, it isn’t “conservative.” It’s crony capitalism. Dave Mann is editor of The Texas Observer.